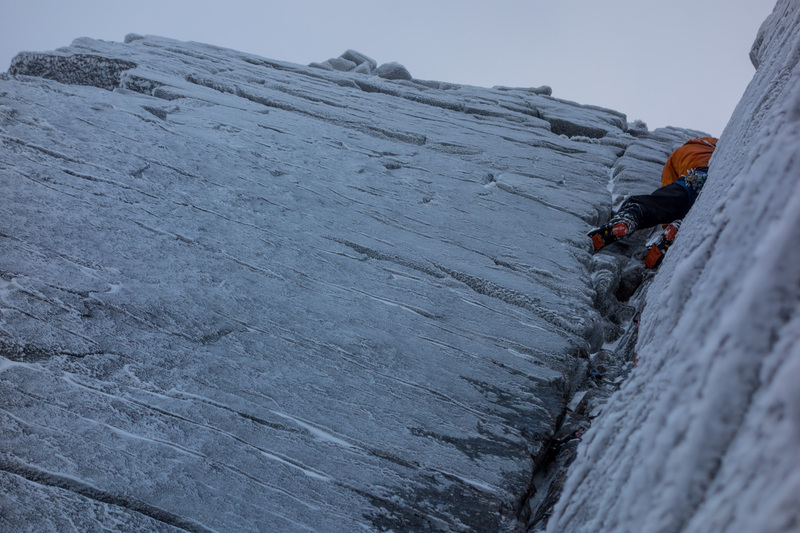 Keen as we were to get our season kicked off, it was great to see fresh snow, cold temperatures and a perfect forecast coinciding nicely to give a weekend of mixed climbing action! 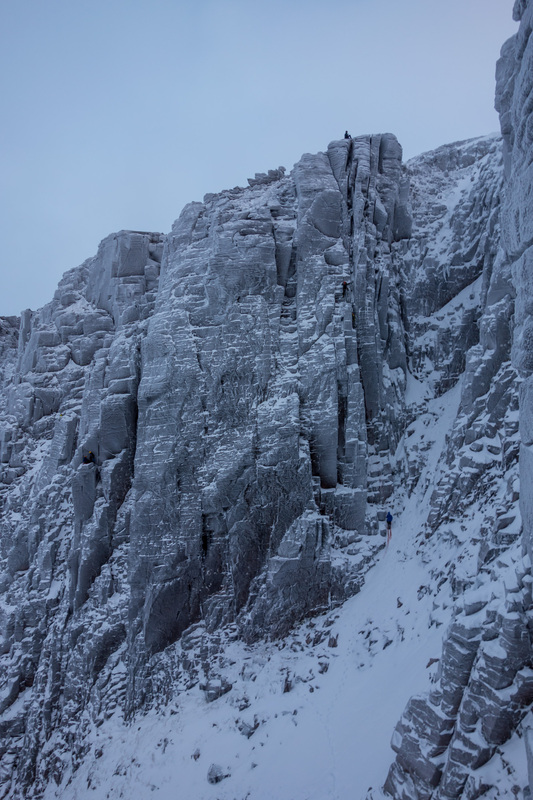 Being high and exposed, Coire an Lochain in the Northern Cairngorms had a good chance of holding the best conditions and it was three very psyched climbers who made their way in on Saturday morning. 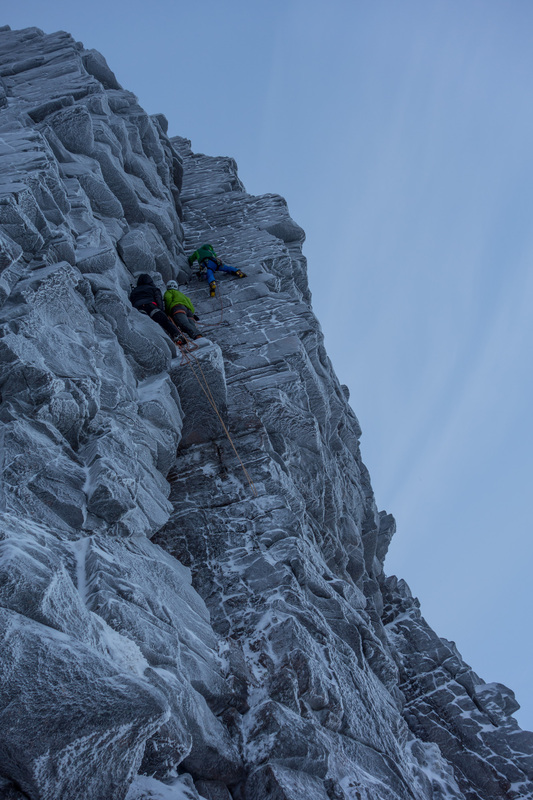 We weren’t alone though – many teams had the same idea and as the early morning light brightened to reveal gently rimed cliffs we knew it was going to be on! 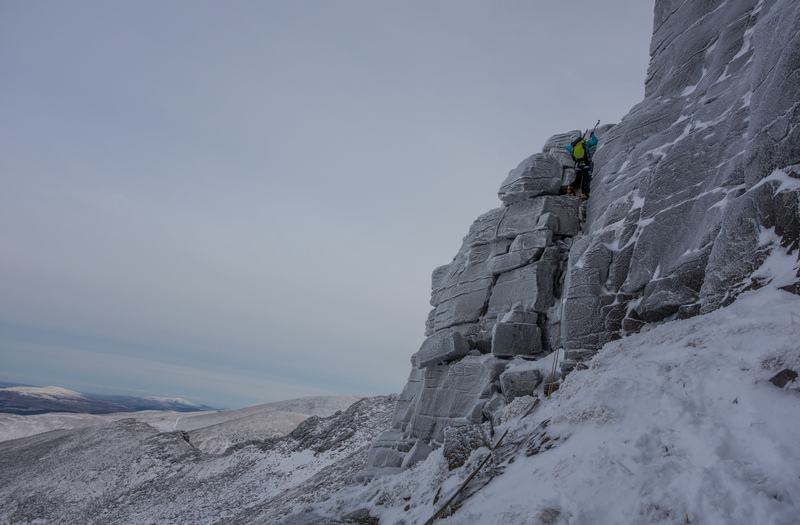 While not hard for some, Savage Slit (V, 6) was definitely going to be an exciting challenge for us! 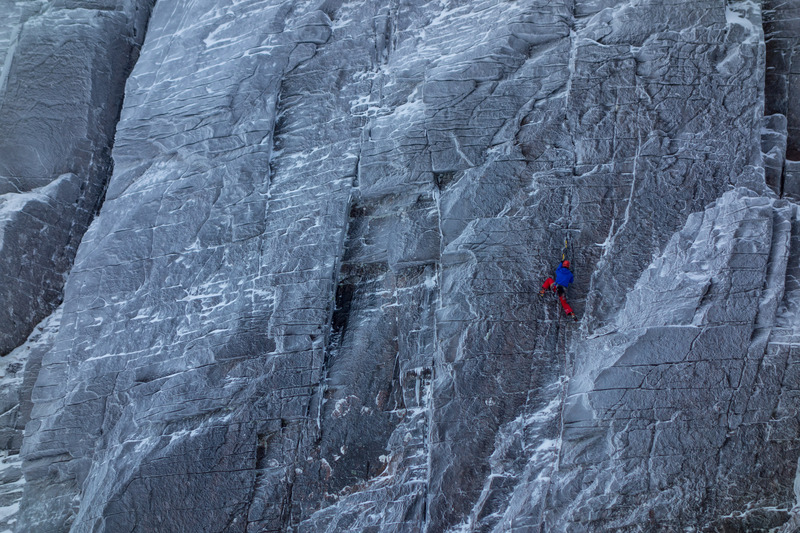 It’s reputation for well-protected, yet technical and strenuous climbing, combined with the compelling and almost unique nature of the line, was just too hard to resist. 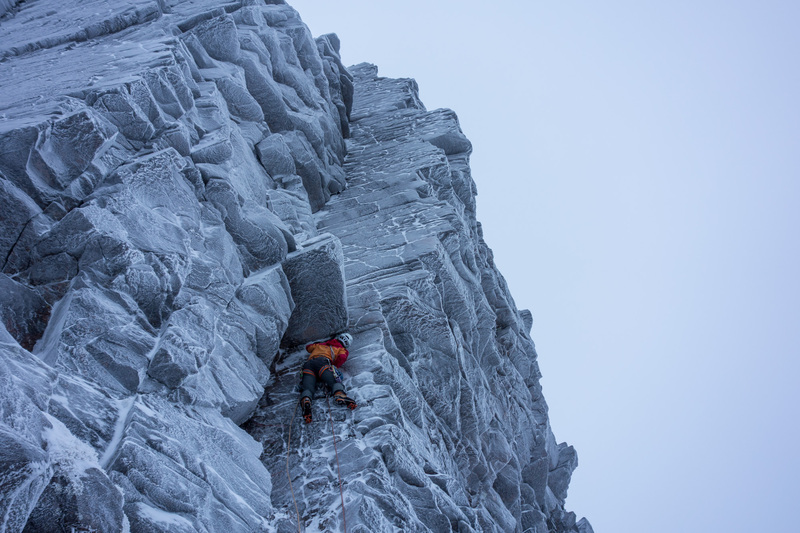 It’s diminutive stature belies the amount of climbing packed in to the series of cracks, chimneys and off-widths, demanding a large repertoire of techniques. Hoping we had what it took, we geared up for a battle. The initial 10 m are deceptive – what appears at first a gentle prelude, transpired to be rounded, insecure and tricky. Joe was unperturbed and dispatched the precarious moves efficiently to deposit himself at the start of the slit. 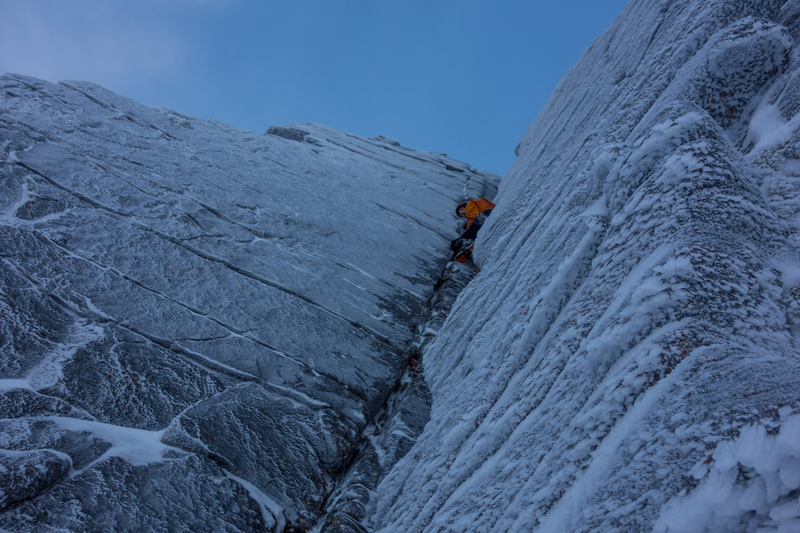 Copious gear followed and with that he launched himself up a thin crack in the right wall. Sinker hooks and sinkier gear, with just enough for the feet, allowed progress to the first chokestone. Some faff ensued to free a jammed rope before Joe disappeared into the bowels of the slit. The rope inched out, strange grunts and animal noises emanated from the depths. As quizzical looks were exchanged on the ground, Joe magically reappeared on top of the next chokestone, sporting a massive grin. The call came down and we set off to join him. The pitch was fantastic – constantly interesting, always tricky, occasionally desperate and culminating in a hilarious subterranean squeeze chimney! 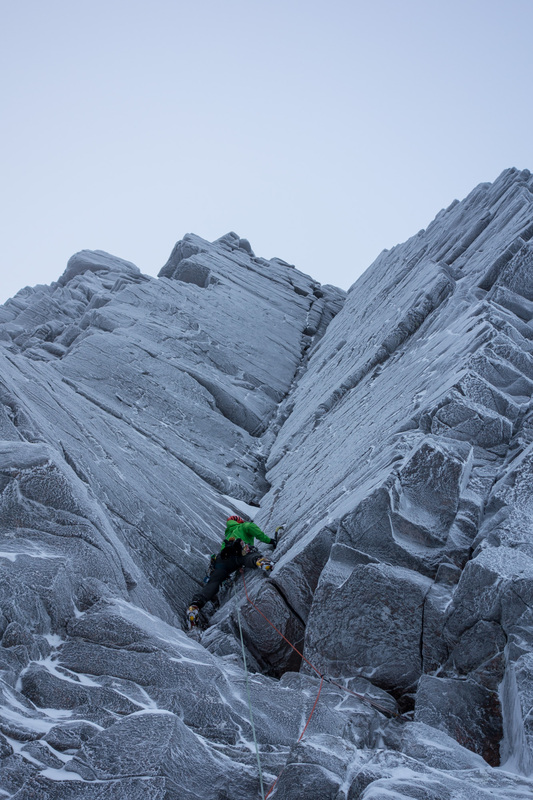 Pitch 2 of Fallout Corner looking just as exciting as the first – a route to aspire to! I nervously took the reigns for the next pitch. Starting reasonably enough with a few bridging moves up a series of ledges on the right wall, all of a sudden an impasse was reached. The good hooks dried up along with the ledges and I had to decide whether to precariously teeter up the outside of the slit or get very intimate with it. Reasoning it would be harder to fall out of a chimney than off a face, I got busy with it. An inordinate amount of effort and time was expended as I inched up the slit, back braced against one wall, front-points skittering along small edges on the other. 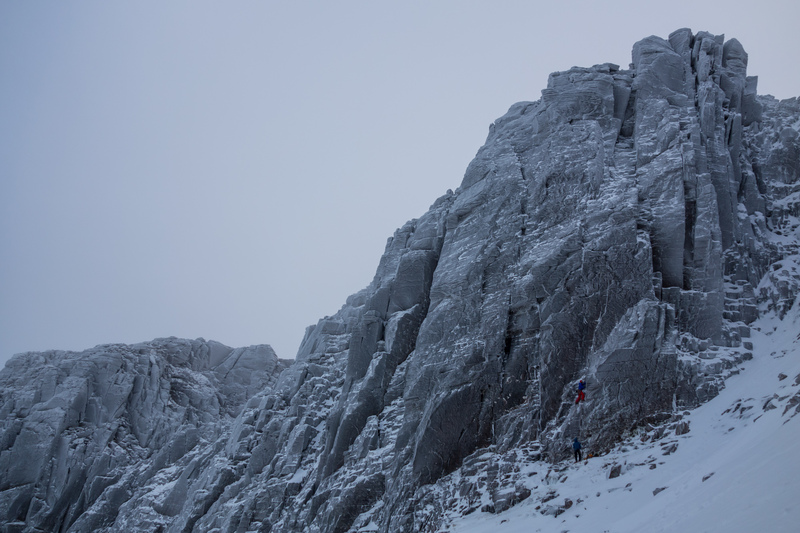 A series of mantle-shelf moves followed before the tat at the next belay was happily clipped – I felt well and truly worked! Joe raced up the final few metres of easier climbing to the in-situ abseil station where we rigged, coiled, threw and descended, carefully following instructions to minimise the chances of a stuck rope. This didn’t work. 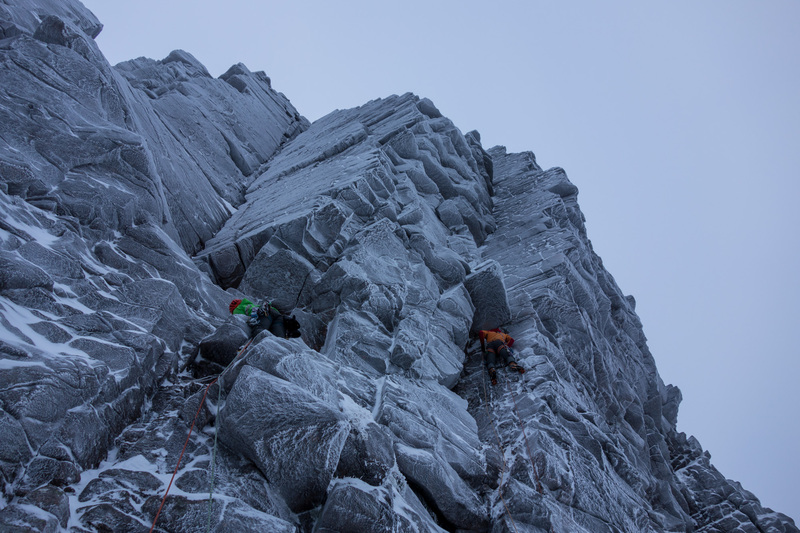 Despite our best efforts something jammed solid and we were forced to descend to town two ropes the lighter. 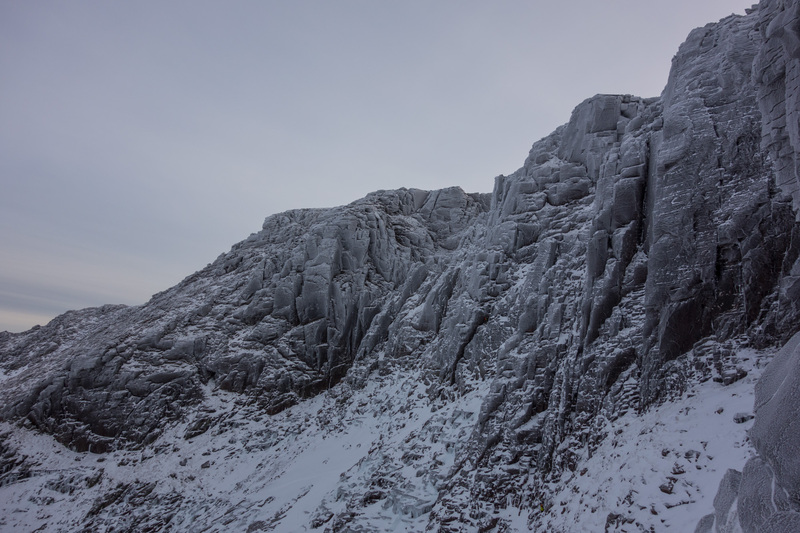 Luckily we had another set of ropes, so a plan was hatched for the following day to facilitate their retrieval. After our beasting on Savage Slit, we all agreed something a little more relaxed was in order, preferably something which allowed us to access the ab station. 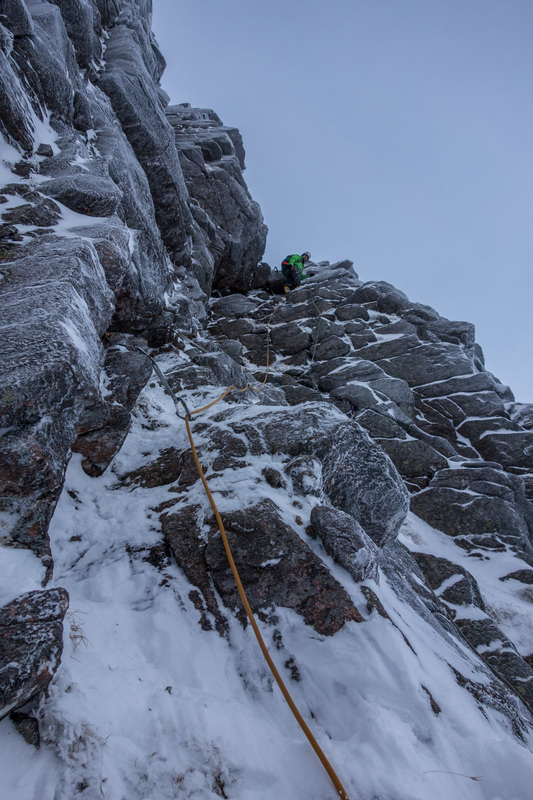 Conveniently, just such a route exists – aptly described in the guide as “an easier route threading the harder classics”, Sidewinder (III, 4) cunningly spirals its way around No. 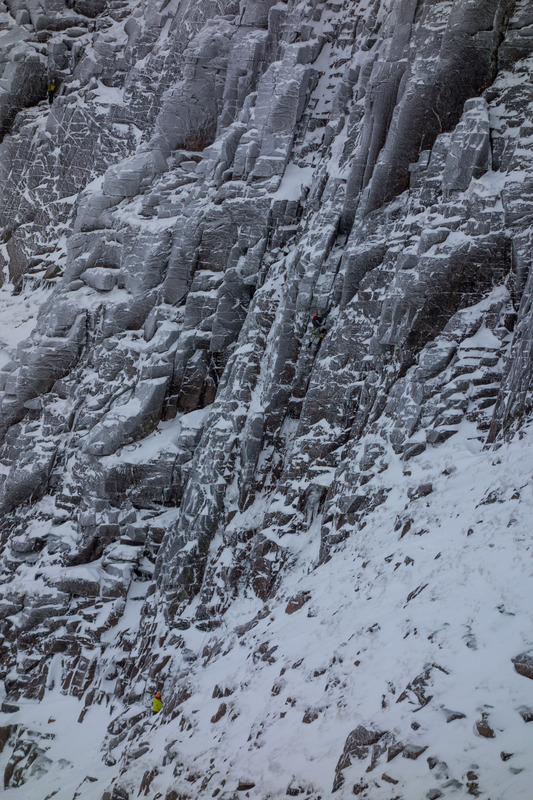 4 Buttress to end up climbing a chimney on the backside of Savage Slit. Ropes retrieved we happily headed down after a brilliant couple of days climbing, fingers firmly crossed for more days like these to come!